Despite its ancestors having feathers, Tyrannosaurus rex most likely had scaly skin, according to fossil evidence. 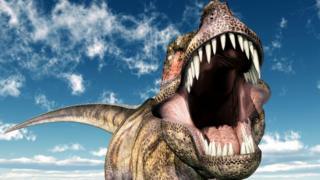 Researchers say the huge predator had scales much like modern reptiles rather than feathers or fluff. The dinosaur may have ditched its feathers because it no longer needed insulation when it reached gigantic proportions, they propose. But the findings are unlikely to end the long-running debate about the physical appearance of T. rex. We don't need to throw out the image of a big fluffy T. rex quite yet, argued one palaeontologist. Whether T.rex was clad in scales, feathers or both, has long been a mystery, largely due to a lack of fossil evidence. The researchers think the giant tyrannosaurs lost their feathers over time because they no longer needed them as insulation. But not all researchers are convinced. Dr Steve Brusatte of the University of Edinburgh said he wouldn't be surprised if T. rex lost or reduced its feathers, as it was a very big animal, just like elephants reduce their hair. Asian elephants are hairier than African elephants because they are smaller and live in dense forests in dim sunlight. "But I don't think we can assume that T. rex lacked feathers just because some fossil skeletons have skin impressions that are scaly," he added. "It takes inconceivable good luck to preserve feathers in fossils. Just because we don't see them doesn't mean they weren't there. So I don't think we need to throw out the image of a big fluffy T. rex quite yet." The Tyrannosaurs were fearsome predators during the last part of the Cretaceous, 85 to 65 million years ago. They were known for their sharp teeth, small beady eyes and tiny forelimbs (arms). The group included Albertosaurus, Gorgosaurus, Daspletosaurus, Tarbosaurus, as well as the iconic T. rex.